It is cheap and easy to coat your concrete floors with an epoxy paint. It can even last a long time if your floor doesn’t get a lot of traffic or abuse. With so many options available like color paint chips or reflective metallic to blend into the epoxy paint your concrete floor is sure to be an eye-catcher! Many business owners think that it is a long term solution. This upscale coffee and pastry café had a beautiful epoxy paint job done on their concrete floors. They had a beautiful dining room for a few months. But unfortunately for the floors, many people walked on the epoxy paint every day to come in and get their morning coffee and bagel. Floor coatings need to be thick enough to absorb the shock of daily traffic. The impact needs to be transferred from the foot to the concrete, and if the floor has no body there is nothing to absorb the shock and transfer it to a wider area, instead it just goes straight through and starts wearing and stressing the thin epoxy coating. Most epoxy paint coatings for concrete floors are just a few mil’s thick. One reason they cost so little per square foot is because there isn’t anything to it. The thinner the coating the less product is required and the lower the cost. But the problem is they just don’t hold up to the daily abuse. Everlast Epoxy has a solution – Everlast Floor is over 12 times thicker than a 10 mil epoxy paint. So it can and does stand up to daily abuse. They can make a nice hard layer all over the floor, but as soon as they get stepped on they crack up much like peanut brittle. But Everlast Floor has a built-in flexibilizer to make it tough and flexible enough to keep it from cracking all up. 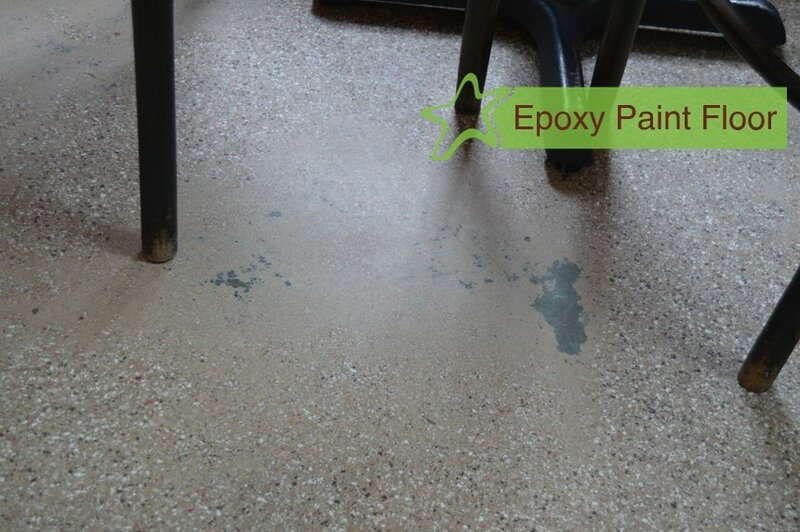 Because the epoxy paint systems are so thin, if anything happens to the wear coat it leaves the whole system vulnerable – which is what happened to this floor.